SPI Gallery, Chance Encounter, magnificent Marlin and Sailfish in brass and set on a round marble base. Approx. 25.5 x 14.25 x 11. Great sculpture for a sport fisherman as a gift or trophy. SPI Gallery, Dolphin and Undersea Friends in brass, set on a highly polished round marble base. 11.5 x 8 x 5 . Dolphin, fish, sting ray and sea turtle entwined in seagrass on coral reef. SPI Gallery, Dolphin and Friends in brass and set on a marble base. Approximately 13.5 x 6.5 x 5.5. The mystery of the sea and fine brass sculptures have long been the hallmark of SPI. 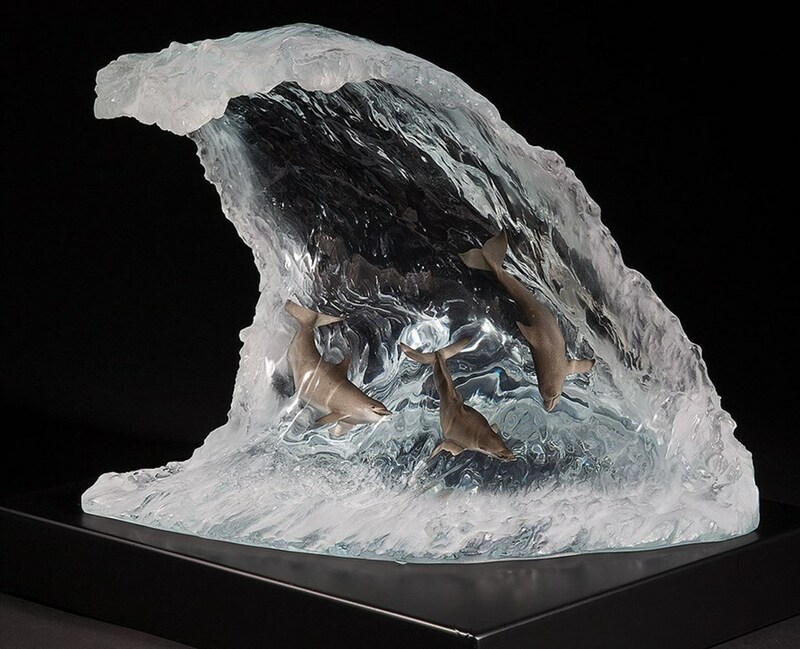 SPI Gallery, Dolphin Seaworld in brass, set on a highly polished round marble base. Approx. 29"h x 13"w x 10"d, 38 lbs. Dolphin, fish, sting rays and sea turtle, all entwined in seagrass on coral reef. SPI Gallery, Humpback Whales in brass, set on polished round marble base. 34 x 12.5 x 11.5, 29 lbs. Two whales, with baby humpback balancing on momma's nose as they ride an ocean wave. SPI Gallery, Fighting Blue Point Crabs in brass and set on a round marble base. 15.5 x 9 x 8. Two crabs swimming through kelp above a coral reef formation. Fine detail with life-like patinas. 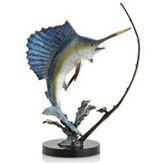 SPI Gallery, Fighting Sailfish with Tackle in brass and set on a round marble base. Approx. 14"h x 11"w x 9"d and 6.5 lbs. 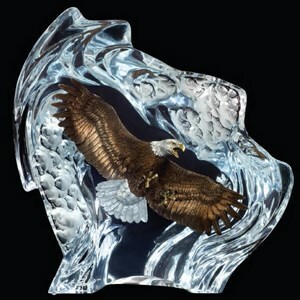 Great sculpture for sport fisherman as a gift or trophy. SPI, two brass marlin and a sailfish ride a wave on a marble base. Dimensions: 24"H 14"W 8"D.
SPI Gallery, Humpback Whales in brass and set on a highly polished round marble base. 11 x 11 x 7. Two whales, mother and baby humpback resting atop a colorful coral reef. Quillan Signed Ltd. Ed. of 75 bronze marlins "Intimidator". Blue Marlin riding a wave on marble base 24 x 21 inches with hand applied patina for lustrous finish. AP available limited to 10 pieces. SPI Gallery, Jellyfish Sextet Sculpture in brass and set on a highly polished round marble base. Approx. 18.5'h x 8"w x 6'd. Ten jellyfish floating gracefully attached to kelp. SPI Gallery, Keys Double, magnificent Marlin and Sailfish in brass and set on a round marble base. Approx. 15"h x 12"w x 6"d and 6 lbs. Great sculpture for sport fisherman as a gift or trophy. SPI Gallery, Large Humpback Whale in brass and set on a marble base. Approx. 16 x 7 x 6. The mystery of the sea and fine brass sculptures have long been the hallmark of SPI Gallery. SPI Gallery, Large Seahorse with coral, done in brass and set on a highly polished round marble base. 18.5 x 8.5 x 8.5. Seahorse entwined in kelp, rests on coral reef, w/starfish, clams & fish. SPI Gallery Let's Eat, Redfish stalking crab in brass in and set on a highly polished round marble base. Approx. 21 x 10 x 10.5. Redfish swims through seagrass in pursuit of a blue point crab. Quillan bronze sculpture "Maui". Signed limited edition of 90 with 9 artist proofs available. Humpback Whale, endangered species series. 2.25 x 2 x 4 inches, hand applied patina. SPI Gallery, Mermaid Console Table in brass and glass with hot patina finish. Life-like mermaid holding a glass table in sitting position on coral reef . Approximately 31"h x 48"w x 18"d.
SPI Gallery, Mermaid Table in aluminum and glass with hot patina finish. Life-like mermaid holding a sea shell in sitting position on metal rock-like pedestal . Approximately 24"h x 22"w x 22"d.
SPI Gallery, Mermaid and Dolphins in brass, set on polished round marble base approximately 21"h x 10"w and 27 lbs. Four dolphins embrace beautiful mermaid as she feeds them a fish. Quillan Signed Ltd. Ed. of 350 bronze vase " Mystic Encounter ". Dolphins adorn beautiful bronze vase. Approximately 13 x 5 inches with removable lid. Artist Proofs available limited to 25 pieces. Quillan Signed Ltd. Ed. of 250 bronze marlins "Off The Slide". Blue Marlin riding a wave, approx. 10.25 x 11 inches with a hand applied patina for lustrous finish. AP available limited to 25 pieces. SPI Gallery, Playground Pals in brass, set on a highly polished round marble base. Approximately 12.5 x 9 x 6.5. Dolphin, pair of fish, sting ray & magnificent sea turtle in seagrass on a coral reef. SPI Gallery, Sailfish Feeding on Ballyhoo in brass and set on a rectangular marble base. Approximately 17.5 x 20 x 10. Great sculpture for a sport fisherman as a gift or trophy. Perfect for home or office. 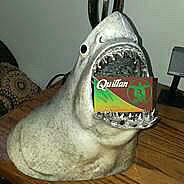 SPI Gallery, Shark with Prey in brass and set on a highly polished rectangular marble base. Approx. 10 x 16 x 6. Large menacing shark, with torch appled blue patina, swims through kelp leaves shadowing his prey. 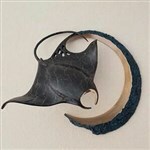 Quillan bronze frog, " Wait for the Moon wall hanging ". Signed limited edition of 44 with 5 artist proofs available. Can be ordered in black crackle as shown or silver crackle. Approx. 12 x 13 x 7" depth.